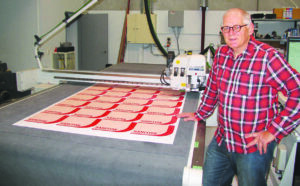 Installing a Kongsberg XN24 cutting table, from Fuji Xerox, has helped Auckland’s I Print On Demand understand how much more it can achieve. “The Kongsberg table unlocks the world of wide format and short run finishing. We can do a run of 10 boxes and make a profit. It’s about tying all of your machines into a cohesive print operation and getting the sales. You have to work out the best way to employ the equipment you have for each job; how you can make it work best. He sees the Kongsberg as indispensable. He says, “If you asked me, of all the things I have, what would be the last to walk out the door, it would be this cutting table. Mills, well-known in the industry, has over 40 years’ experience to call on. He runs the plant with two staff who perform a range of skills.